World Kindness Day takes place internationally every November 13th. It highlights and celebrates good deeds in the community. This day gives us a great feeling when we all wish to help each other without demanding gratitude. It’s good to know that we live not in an indifferent world, but on a planet where you can get help from a stranger without a second thought. Especially for World Kindness day, we at Bright Side found 19 amazing stories of kindness to continue spreading good across the world. A man saved a drowning dog. In the picture, you can see that he even didn’t take off his shirt to help the dog and its owner who was very worried and crying. An Athenian man captured with his camera the touching scene of a guy approaching a homeless man and spontaneously giving him a pair of athletic shoes during the crisis in Greece. The homeless man started to cry because of the unexpected act of kindness. Erik and Torvald from Norway were out taking some photos with their new camera when Erik saw a lamb drowning in some waves. Immediately the guys sprung into action and saved the lamb’s life while forgetting about their own safety. A photographer took pictures at a children’s hospital in Sao Paulo where the window washers dress up as superheroes. They even come and say hi in front of each window. Their visits lift the children’s spirits and make them happy and excited to meet the superheroes. This fireman is comforting a scared cat he rescued from a fire in Denmark. The cat’s eyes are full of fear and the fireman hugs it to calm it down. Photographer Juancho Torres took a photo of Orlando Beltran who was helping a homeless man in Bogota. Volunteers distribute food and medical help for the many homeless people in the area. Antonio La Cava is a retired schoolteacher from Italy, but he keeps spreading the love of reading among children. He bought a used motorbike and modified it to hold a library of 700 books. kids to love to read. Antonio purchased all the books with his own money, and every one of his visits to these small towns turns into a big event for local kids. A kind-hearted man named Lazaro Nolasco gave his white t-shirt and his hat to help a homeless guy who was half naked. Nolasco boarded the train at Washington Heights and suddenly saw the need for this act of kindness. The stranger even helped the homeless man put on the t-shirt. A man rescued 4 puppies during a flood. Adult dogs were already on the top roof and were worried as they watched him save the babies. 10. A suited-up groom jumped into a lake to save a child. The photographer was taking pictures of the bride when a little boy was pushed into a lake. The child had fallen into the water and was drowning. By the time the bride noticed and started to shout out, the groom Clayton had already jumped in without any hesitation and pulled the boy back. Twice a day, Arnetta Griffin comes to the same street in Wisconsin to feed homeless people. She has cooked meals in her own kitchen and packs them in individual containers. During lunch and dinner, she goes to hand out the food to needy people who spend their days in Uptown. Griffin lives on social security disability because she has rheumatoid arthritis. She uses her own money to help other people. Joshua Coombes is a young stylist from London and he helps people without expecting anything in return. Joshua gives haircuts to homeless and needy people for free all over the world. He talks to them, connects with them, and makes their mood better as he gives them minutes of happiness when they see the final result of their new style. It was so hot in Australia that koalas started to ask people for water. These kind cyclists couldn’t be indifferent and stopped to help the thirsty koala. The koala grasped the cyclist’s leg which is very unexpected from a wild animal. This picture was taken by Paula Bronstein who shared a story with us about the only hospital in the world for elephants. Medical care brings hope to animal owners and puts less stress on the elephants so they can keep working and continue earning money. This elephant is named Motala and she is 50. Motala lost a foot after stepping on a mine. She was treated in the first elephant hospital and got a prosthesis according to her weight and measurements. During a flood, a fireman took an elderly woman on his arm and started to carry her. This picture is the quintessence of help and optimism. 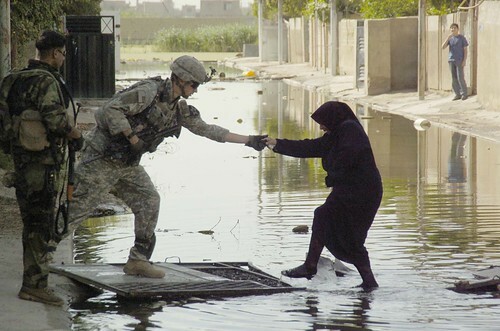 Nick Crosby who works in the U.S. Army helped an Iraqi woman cross a water-filled street. This shot was taken during a cordon and search mission in Al Risalah. Kindness exists everywhere and doesn’t have boundaries. David Livingston took this picture in Los Angeles. Mayor Antonio Villaraigosa washed Rosa Pacheco’s feet at the Los Angeles Mission and Anne Douglas Center’s Thanksgiving Meal for the Homeless. It is always better to pick kindness. What selfless good deeds have you done for other people? Has a stranger ever helped you in a moment of need? Share your stories of kindness with us.